As a young Jewish boy trying to survive the Holocaust in Poland, Marian Marzynski felt nothing but terror at the sound of the German language. Once, riding on a trolley outside the Warsaw Ghetto, a Nazi officer sat five-year-old Marian on his lap and called him a "nice boy." "I was choked with fear," Marzynski later recalled. For years, he lived with this fear of the people who had invaded his country and killed much of his family. When the German government announced that it was planning to build a "Memorial to the Murdered Jews of Europe" to mark the 60th anniversary of the end of World War II in May 2005, Marzynski decided it was finally time to go to Berlin himself. "I wanted to achieve what my perished relatives could not," Marzynski says. "To feel safe among the Germans." In "A Jew Among the Germans," FRONTLINE presents Marzynski's moving and provocative search for a Germany that he -- and his children -- can live with. 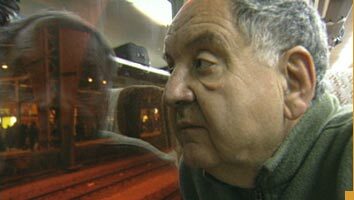 Over several years of filming, Marzynski encounters artists, architects, and everyday Germans, who wrestle with the big questions of guilt, responsibility, and memory. He also meets a young, "third generation" of Germans who have broken with their parents and grandparents over the war. Rejecting collective guilt, these young Germans are looking for a way to keep the Holocaust in living memory. "The offspring of the perpetrators complain that they grew up without any of the victims in their sight," Marzynski says. "Now I am here and am ready to extend my hand." In Berlin, Marzynski meets Dani Karavan, an Israeli sculptor whose plan for the German memorial is a giant Star of David with flowers. When Karavan begins to draw it in the dirt on the site, a security guard stops him and demands Marzynski's filming be stopped, saying the site is off-limits without special permission. "This is why the memorial will never be built," Karavan tells Marzynski. "[The Germans] don't want this." One of the jurors of the memorial competition, an art museum director from Hannover, tells Marzynski that his father was a Nazi. "Could you talk with him about the war?" Marzynski asks. "No," the man responds." Some questions still cannot be asked in Germany." At Berlin's new Jewish Museum, Marzynski finds Johannes Schwartz, a young Gentile who teaches Germans about Jewish religion and customs. Marzynski thinks the museum's program is well intentioned, but even Schwartz concedes that it's hard to change minds. "An anti-Semite coming here won't be changed in a museum like this," Schwartz says. "That's what we are told in our training, that you won't change anybody in here. I can just offer some knowledge and let people ask questions." Peter Eisenman, the American architect who ultimately wins the competition to design Germany's Holocaust memorial, tells Marzynski of his plan to erect several thousand concrete slabs in towering, tilting lines on the memorial site. "We wanted to get over the idea of the Jew as 'other.' We wanted to bring the Jewish cemetery to Berlin." But Marzynski fears that Eisenman's design reinforces a bad message: that the only Jews who can safely dwell among the Germans are dead ones. He favors a German artist's plan to ask the question "Why?" in the 31 languages spoken by the victims, and then to record the public's answers in a process of reflection that would never end. On May 10, the German Holocaust memorial was unveiled in Berlin, (see photos) and Marzynski feels ambivalent about it. "I wish there would be no celebration of the end of World War II, no finishing touches," he says. "I don't want a memorial that forces young Germans to live with their grandparents' guilt forever, but without it, I'm afraid that the tragic past will be forgotten altogether. My unreasonable request to the German people would be to live in the permanent state of guilt. A good guilt, if such a thing exists."